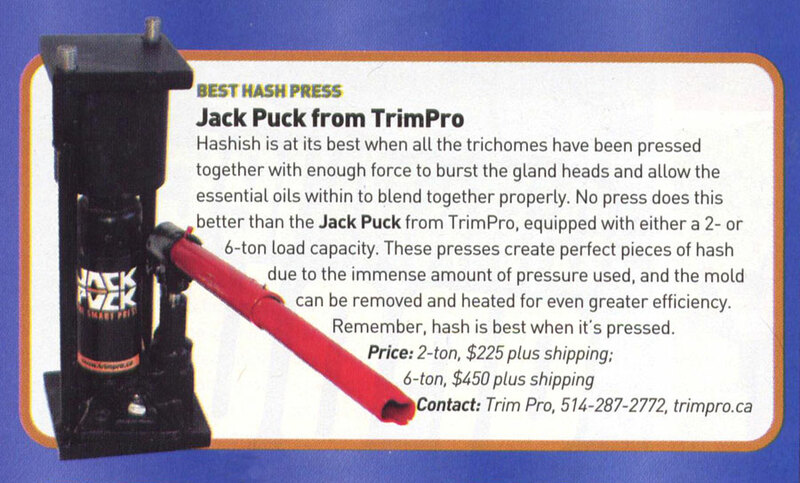 We’ve always loved the incredible trimming products available from multiple STASH Award winners TrimPro, and year after year they continue to outdo themselves in technical achievements. Their newest advancement is the TRIMPRO ROTOR, a completely automated unit encompassing all the best qualities of their classic Trimpro, but with higher walls to keep your prized plants in the cutting zone. Simply drop your buds in the bucket and watch as the non stick rubber arms gently moves them around and the High quality tempered steel blades, leaving you with perfectly manicured buds every time. Introducing another new machine this year, the Trimpro Rotor. The design deviates from the traditional Trimpro but encompasses the same pride and engineering. The plants are gently rotated over the grate by leather fingers and trimmed by the razor sharp Trimpro blade system. This machine compliments the Trimpro Automatik by using a different technique to move the flowers on top of the grate. 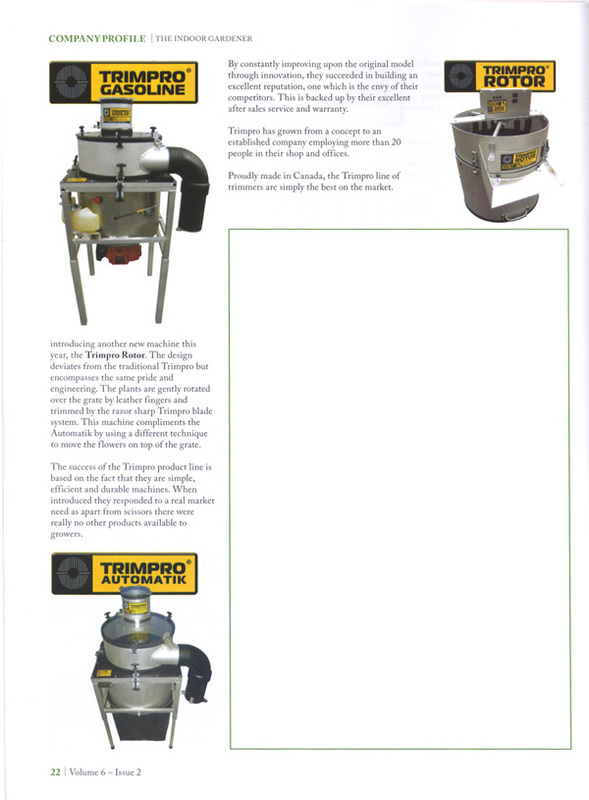 The success of the Trimpro line is based on the fact that they are simple, efficient and durable machines. 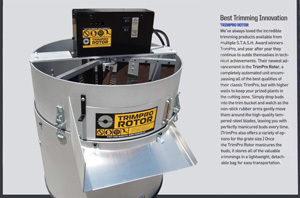 Proudly made in Canada, the Trimpro lines of trimmers are simple and the best on the market. 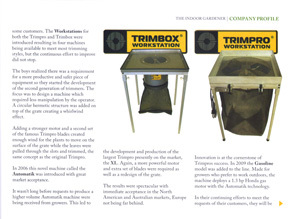 The Workstation for both the Trimpro and Trimbox were introduced resulting in four machines being available to meet most trimming styles. Bu the continuous effort to improve did not stop. 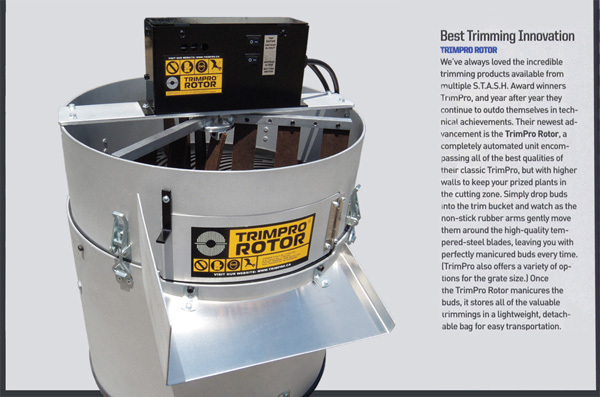 Trimpro crew realizes there was a requirement for a more productive and safer piece of equipment so they started the development of a second generation of trimmers. The focus was to design a machine, which requires less manipulation by the operator. A circular hermetic structure was added on top of the grate creating whirlwind effect. This novel machine called the TRIMPRO AUTOMATIK was introduced with great market acceptance. It wasn’t long before requests to produce a higher volume Automatik machine were received from growers. 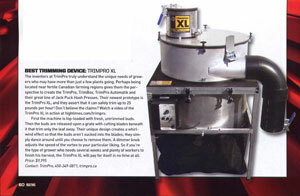 This led to the development and production of the largest Trimpro presently on the market, the TRIMPRO XL. In 2009 the TRIMPRO GASOLINE model was added to the line. Made for growers who prefer to work outdoors, the machine deploys a 1.3 hp Honda gas motor with the Automatik technology. Moving and trimming huge outdoor harvests requires plenty of work and risk- so why not trim your whole harvest in the field and bring home only the buds for drying? Introducing the Gasoline from TrimPro, a portable unit that allows you to complete the entire trimming process right at your outdoor grow site. It is basically the same as the TrimPro Automatik, which won STASH Award last year, but with the ability to run anywhere. The four-stroke Honda motor makes it quieter and more reliable than ever, and you can adjust the speed of the blades to suit your preference. Once again, the Canadian research team at Trimpro has produced an essential product for the outdoor cultivator that reduces risk and simplifies a difficult task. 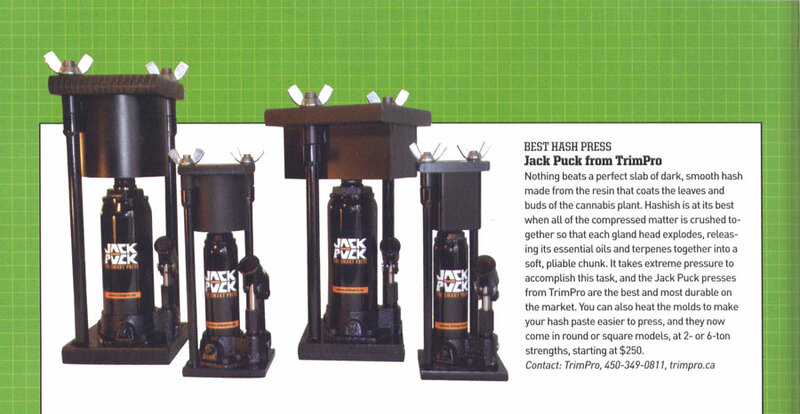 The Jack Puck presses are the best and most durable on the market. You can heat the molds to make your paste easier to press. They come in round and square models at 2- or 6 ton strengths. The inventors at TrimPro truly understand the unique needs of growers who may have more than just a few plants going. 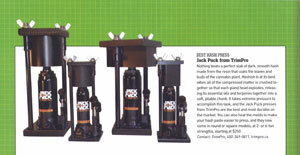 Perhaps being located near fertile Canadian farming regions gives them the perspective to create the TrimPro, Trimbox, TrimPro Atomatik and their great line of Jack Puck Presses. Their newest prototype is the TrimPro XL, and they assert that it can safely trim up to 25 pounds per hour! Don't believe the claims? 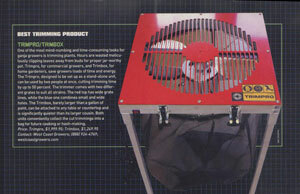 watch a video of the TrimPro XL in action at hightimes.com/trimpro. First the machine is top-loaded with fresh, untrimmed buds. Then the buds are released upon a grate with cutting blades beneath in that trim only the leaf away. Their unique design creates a whirl-wind effect so that the buds aren't sucked in to the blades; they simply dance around until you choose to remove them. A dimmer knob adjusts the speed of the vortex to your particular liking. So if you are the type of grower who needs several weeks and plenty of workers to finish his harvest, the Trimpro XL will pay for itself in no time at all. If your biggest problem is a harvest so large that trimming is measured in days instead of hours, the Trimpro Automatik is the new product for you. Simply load untrimmed buds into the unit and the spinning cutter blades do the rest. You determine how closely manicured you want your buds to be and release them from the unit through a built -in chute into a wasting container. Trimmed leaf is conveniently caught in the netting below the blades. One of the most mind-numbing and time-consuming task for growers is trimming plants. Hours are wasted meticulously clipping leaves away from buds for proper jar-worthy pot. 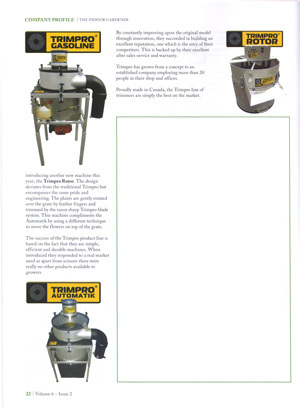 Trimpro, for commercial growers and Trimbox for home gardeners, save growers loads of time and energy. 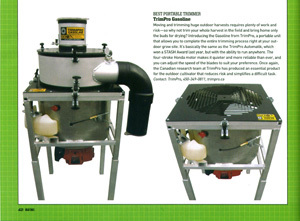 The Trimpro, designed to be sep up as a stand-alone unit, can be used by two people at once, cutting trimming time by up to 50 percent. Both units conveniently collect the cut trimmings in to a bag. Scissors are fine for a humble harvest, but for those with a big bounty of buds to trim, only a machine can keep up with the demand. 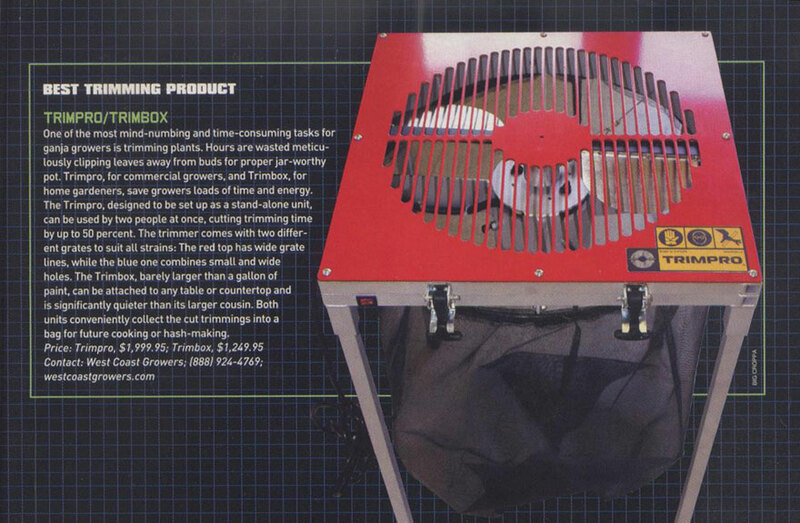 Outdoor growers and indoor adventurers with pounds of plant matter require quick and efficient solutions, and the TrimBox has remained at the top of the field. The spinning blade pulls in all extraneous leaf and chops it to your own desired degree of closeness to the bud, while a convenient bag below collects the trim. Several available attachment can change the degree of leaf intake with different grates or turn one machine into a workstation for tow workers to trim simultaneously. It is smaller and quieter than the original TrimPro, making it perfect for anyone growing by the pound.